For some people, gardening is a passion. Some people garden just as a hobby. For still others, it?s a way to feed their families. We think Shirley Mac Claine's character in "Steel Magnolias" said it best. "Because that's what Southern women do, we wear funny hats and grow things in the dirt." You don't have to be from the South or be a woman, or even wear a funny hat to enjoy gardening. The thrill of seeing your first red, ripe tomato or watching your first stalk of corn reach from the ground can be an amazing experience for many people. Gardening is also a great way to provide healthy food for you and your loved ones. When you buy produce from the store, it just isn't the same as presenting a salad to your family that came exclusively from your garden worked by your own two hands. Many people choose to garden so they can have control over what type of food they eat without fear of chemicals or preservatives. Often, commercially grown produce is cultivated in greenhouses with the use of pesticides and chemicals to enhance their growth. A quick study on these types of artificial applications can be unnerving for anyone. The side effects of chemical pesticides on the human body can truly take its toll. So many people are jumping on the "organic bandwagon" as a way to minimise the risks to themselves and their loved ones that often comes with commercially prepared foods. You don't have to be a health nut to embrace organic gardening. Imagine the wonderful way you'll feel knowing that you are serving foods that were grown all naturally without the risks that come from applying chemical fertilisers and pesticides. It's easier than you think. If you've been gardening for years or are just beginning to grow your own food, organic gardening can provide you with peace of mind and pride in your produce. Don't have any clues how to start? That's why you're reading this book! 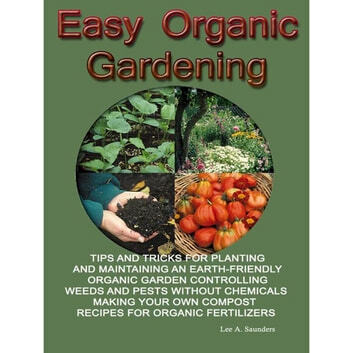 We will explore the advantages of organic gardening as well as the best way to begin your all-natural garden. We'll give you ideas about mulching, weed control, and composting. Plus, we'll give you some ideas on all-natural pest controls and ways to make sure your garden thrives without chemicals! Enjoy your ebook "EASY ORGANIC GARDENING!"